After a very lengthy delay, Elder Scrolls Online: Tamriel Unlimited has finally arrived! Being a huge fan girl of the Elder Scrolls series, I couldn’t be happier, and that itch to dive back into Tamriel on my PS4 could now be scratched. Fresh off the bat from playing The Witcher 3 for two weeks straight, jumping back into another RPG has taken over my life again. Unlike The Witcher 3, you need to put many, many hours into Elder Scrolls Online before the best content is accessible. Is it worth it? Absolutely, but there’s still one or two problems with it. Developed by ZeniMax Online Studios and out now for PlayStation 4 and Xbox One comes Elder Scrolls Online: Tamriel Unlimited, a massively multiplayer online role-playing game (MMORPG), and is set in the continent of Tamriel like the other games in the franchise. The events that happen throughout ESO are set around 800 years before Morrowind and Oblivion, and a millennium before Skyrim. Following the trend of previous Elder Scrolls games, you once again start your journey as a prisoner. The game also has a similar structure to Skyrim, with two conflicts progressing at the same time: one conflict seeing three alliances fighting against each other to sit on the Imperial Throne, and the other leaving the fate of the world in the balance. 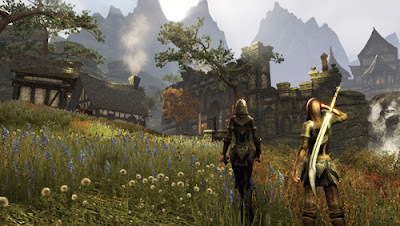 Players must create a character before playing the game, and can choose to join one of the three alliances: Daggerfall Covenant (Breton, Redguard, and Orc), Aldmeri Dominion (High Elf, Wood Elf, Khajit), and Ebonheart Pact (Nord, Dark Elf, Argonian). Different races have different perks, accommodating every play style, so it’s best to pick your character on your style of play. Each alliance will offer the player different quests; however if you’re wanting to play with your friends, you must be in the same alliance. Although this could be seen as a problem, it’s all down to the PvP, where members of the three alliances will battle it out in Cyrodil, but we’ll get on to that later. There’s always something to do in Tamriel, as the world is packed with main and side quests. Although it’s an online game, it offers numerous solo missions for those who prefer to wipe out hordes of enemies alone. On top of that, there are numerous four-player dungeons to search, high-levelled bosses to fight, “Dark Anchors” that spawn numerous enemies in for any number of players to defeat, and Shrines to discover, which allow the player to fast travel. Packed with content and packed with players, it’s sounding like a perfect MMO, right? Unfortunately, the quests for the first 25 levels or so are ridiculously boring. I’m aware that RPG’s tend to have some “fetch quests” – a quest where a player must travel across the map, pick up an item, then return it, but ESO has way too many right at the start, and at times they drained the life out of me. It’s a shame, because the characters have so much to say, and in some instances what they have to say is actually longer than the quest, which then made it pointless to read all the dialogue because you could gather the premise of the quest just by reading the answers your character could provide. It really took me out of the game – I wasn’t immersed in the task I was doing, and aimlessly running around to pick up ingredients for someone to make juice, or feeding a frog chow so it can win a race was one of the worst grinds I’ve experienced in a game. It’s not all doom and gloom though, as when you reach around level 30, the main and side quests start to open up. More objectives, more enemies, and more challenging areas is what I needed to drag me back in, and that’s exactly what I got. The dialogue was worth reading, the story was evolving into something worth paying attention to, and the loot was getting better, with added perks to improve your character overall. ZeniMax have truly saved the best till last. The combat in the game is pretty tactical, as players must manage their stamina and magic energy bars. Jumping into a crowd of enemies may backfire, so combining light and heavy attacks with parries and blocks, as well as crowd control and restoration spells, will provide players with intense fights throughout the story. You’ll unlock more abilities when you level up, and once you have the second ability bar unlocked, you can be prepared for any sort of fight. Whether it’s a horde of enemies for crowd control, or one high-levelled enemy, the game and quest quality starts to improve drastically. Let’s finally get round to Cyrodil – the PvP area for ESO, and what an experience it is. To summarise, the three alliances battle it out to claim the most territory, ranging from controlling castles to capturing Elder Scrolls. Entering Cyrodil as a nooby level 13, filled with confidence because of the new spells I’d learnt, I felt ready to conquer all the castles in Cyrodil – it didn’t pan out like that. It’s a lot bigger (and punishing) than I expected, as me and three friends ran over a hill chasing one player, to be greeted by a pack of 20+ other online players waiting to obliterate us. We fell for the bait, and although we were completely destroyed, it immediately showed the potential and appeal the PvP has. Since then, I’ve managed to take castles as part of a 24-player group; working together tactically to heal each other and destroy the rest – I haven’t enjoyed an online mode as much as this in a very long time, and it’s a mode I’ll be spending hundreds of hours in over the coming months. In my reviews, this is usually the part where I talk about the glitches in games, but The Elder Scrolls Online has surpassed my expectations once again. A game this big, with so many people playing it, and the only bugs I’ve experienced is my character riding through the floor opposed to riding their horse, and being stuck in a rock in PvP, which led to my death. The extra year to work on the game has benefited the game without a doubt: It runs smooth, the only lag I’ve experienced is in the starting area (understandable, of course), and bar two occasions where I’ve had to restart my console due to a loading screen, the longest I’ve waited is a minute. Once again, taking into consideration how big the game is, that’s not bad whatsoever. Overall, Elder Scrolls Online: Tamriel Unlimited is a great MMORPG, and has plenty of content for players to work their way through. Although I’m level 36, I’ve been reminded by many players that there’s “Undaunted Challenges” that unlock at level 45, as well as the Veteran ranks, which unlocks even more content. The visuals are easy on the eye, and it runs incredibly well considering the size and how busy the game is. The PvP is arguably the best thing about the game, as you’ll be involved in huge fights in many different battlefields – it’s intense from start to finish. The one big downfall is that the boring quests arrive in bulks, which really took me out of the experience, but the quests later on restored my faith in the story. It’s a game that’s better played with friends, and be prepared to put hundreds of hours into playing this game. Elder Scrolls Online: Tamriel Unlimited provides a pleasant return to the continent, and receives a 4/5.